If you are a newcomer to river salmon fishing, you ought to know how to fish the tail end of a salmon pool - the section of a pool where the water begins to shallow up before it rides swiftly over a shallow often rock-strewn glide. 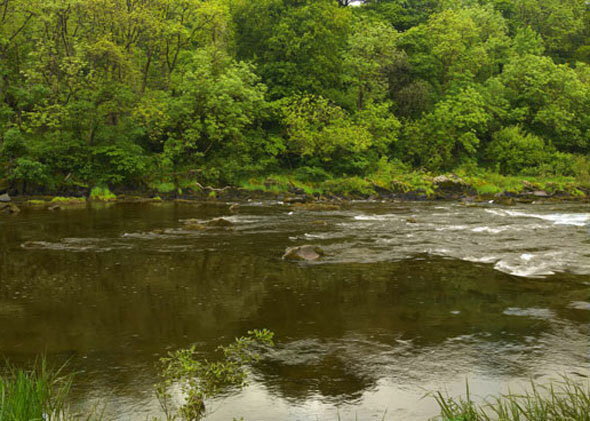 It is within this section of the river where you are very likely to encounter your first salmon as it takes a little refuge before continuing its journey. The middle of large pools are often sluggish. Therefore it may be necessary to retrieve your fly. You can vary the retrieve from a figure-of-eight to long, slow draws, as pictured above. If a fish takes, you will feel it more than you would in the conventional way, but try not to strike or lift the rod. Let the fish take line as before. If after going down the pool you have had no interest at all, try fishing a bigger fly such as a Collie Dog (below) stripped steadily through the pool. This method can at times provoke an instant reaction from salmon that have ignored conventionally fished flies. The slower glides above or close to the tail of a pool are classic resting places for fish that are running the river. This is especially so in pools that have significant lengths of fast water below them through which the salmon have had to travel. They will have expended a lot of energy running through this fast water and will find “comfortable” water in the tail to take a rest before they continue their journey. Tails of pools are the most likely places to see running fish. They are recognisable by the way they “porpoise” through the pool. Running fish are notoriousy difficult to catch, but they may take a brief rest near the head of the pool before negotiating the rough water above.This is when they are most likely to take your fly. Go through the pool again? Yes. If you had no interest on your first run through, don’t assume the same will happen again. Take a rest and start again. If fish are running they may be entering the pool frequently and may rest for only a few minutes before moving on again. Your first run down may not have coincided with a resting fish.